I was asked recently why Inclusion WA tends to focus on sport and recreation. It’s a good question and the answer is quite simple, firstly many individuals we work with are interested in becoming involved in sport (we are Australians after all) and secondly more and more sports and recreation providers are seeking assistance to build their clubs by becoming more welcoming of all people in the community. Sport is genuinely a great social connector – whether you actively play or are just an ardent supporter of a team. These alone are pretty powerful reasons why we will keep working with mainstream sports to help them on their journeys to be welcoming of us all – and why I’m sure we will still have plenty of interest from people wanting support to connect into sport. It’s also why I am thrilled that Woodside has come on board to add additional support to that provided by DSC to allow us to keep working alongside sporting clubs in Karratha. The Woodside-operated North West Shelf Project is supporting Karratha! Olympic fever well and truly hit Little Athletics 4 All - with over 360 partipants attending over a 6 week period. Inclusion WA is now offering a new training session, specifically for Disability Employment Service Providers. Have you connected with us through Facebook yet? Our Facebook page is the place to go to for events, inclusive opportunities and other topical news and stories in WA. Click here to go through to our page and like us now! 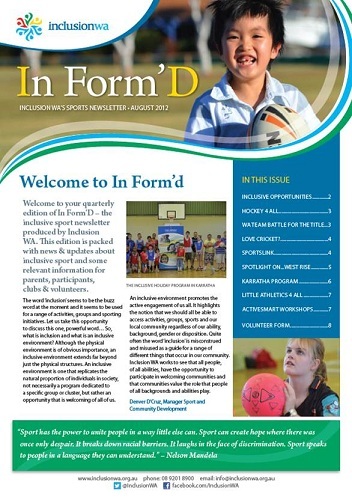 If you're interested in all the latest news from our Sport and Community Development Team, read the latest issue of In Form'd! This month, Youth Connect Coordinator Jessica Kain shares a story of one of her young members, Jess. Jess was about to leave school and wanted to find an activity to meet new people and try something new. 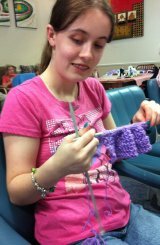 Jess identified knitting as one of her interests, and shared her passion for helping people, so we researched and found a volunteering position at a knitting group in an Aged Care Home. Jess went in once a fortnight to knit rugs for hospitalised children with the residents. After some time, the group stopped meeting, so we got back to planning and found a knitting group that met at Jess’s local library. Jess has never been confident on public transport or crossing roads because of her Cerebral Palsy and she wasn’t quite sure if she could do it alone. Jess’ confidence began to grow as they practiced crossing the road regularly and started catching the bus to the library every fortnight. They also talked about other things Jess would be able to do if she overcame this barrier. After several weeks Jess asked to go on the bus and cross the road alone - it was the first time she had done either. Two weeks later her Youth Development Officer stopped going to the knitting group altogether. Since then, Jess has rearranged her work schedule to be able to attend the group every week. Sometimes she meets friends afterwards to go out for lunch, something she could never have done when she relied on others so heavily. Jess is also hoping to start going to the Spotlight knitting parties with the other members of her knitting group. She now has the confidence to attend activities alone, the skills to catch public transport independently and more people in her life that she shares interests with. Hockey 4 All in the October School Holidays -Curtin Trinity Pirates (CTP) 3, 4, 5 October and WASPs 8,9,10 October. This Hockey program is designed for kids of all abilities - come and have a go at Hockey! Karratha Inclusive School Holiday Program - 6 days of sports over two weeks starts on the 2nd October! For further information about the program, contact us here at Inclusion WA.